We are a busy family of 6. Myself, my husband, and our 4 children; son age 3, daughter age 9 and sons age 11 and 13. As a family we love the outdoors and enjoy fishing, hunting, boating, dirt biking and exploring new places and spending time at the cabin. We have a small hobby farm. We have an outdoor dog and two cats as well as bunnies and chickens. 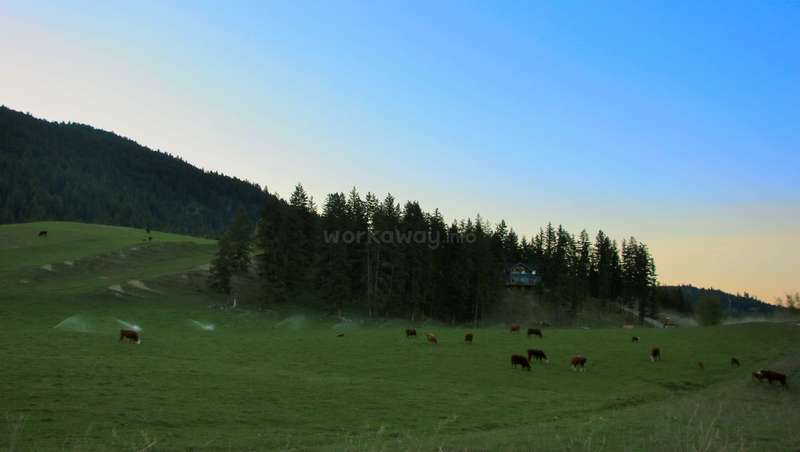 We built our dream home on 15 acres which attaches to our families 1300 acre cattle ranch. We enjoy getting to meet new people and learn about their cultures. We have already formed some amazing bonds through workaway and hope to make some more lifelong friends. My husband is a full time farmer and logger and I work three days a week at the elementary school that our oldest three children attend. Therefor guests must be independent and comfortable spending some time on their own. We are looking to host people who want to come check out a beautiful new area in exchange for some help around our home and yard. We are easy going and We enjoy sharing our home with people who bring laughs, good times, new ideas and a willingness to help out. Learn what daily life is like here in Canada. We also invite you to join our family on outings to see the beauty that surrounds us. Willing to teach you skills you'd like to learning where we're able. 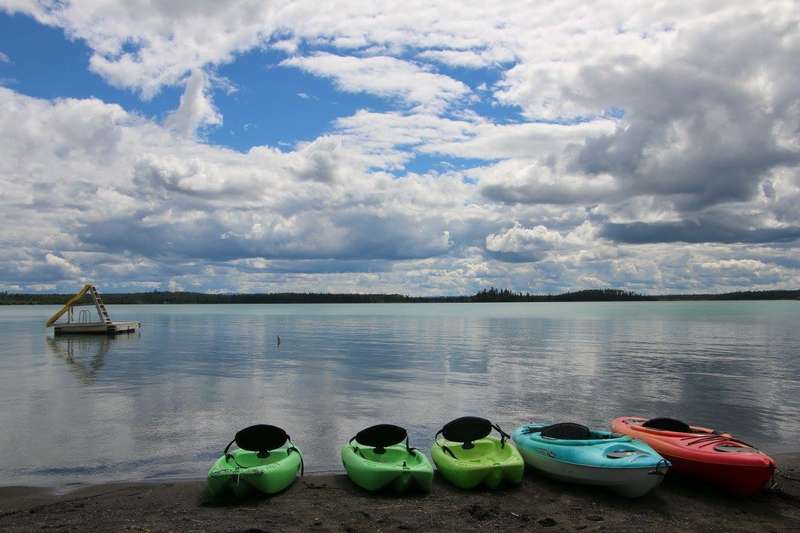 There are lots of beautiful lakes in our area and we’d love to take you to them to swim, kayak, go boating/ tubing etc, or whatever your heart desires. We have the beautiful Wells grey park just over a hour from us where you can do lots of hiking and visiting water falls. We are surrounded by beauty! Come explore it! 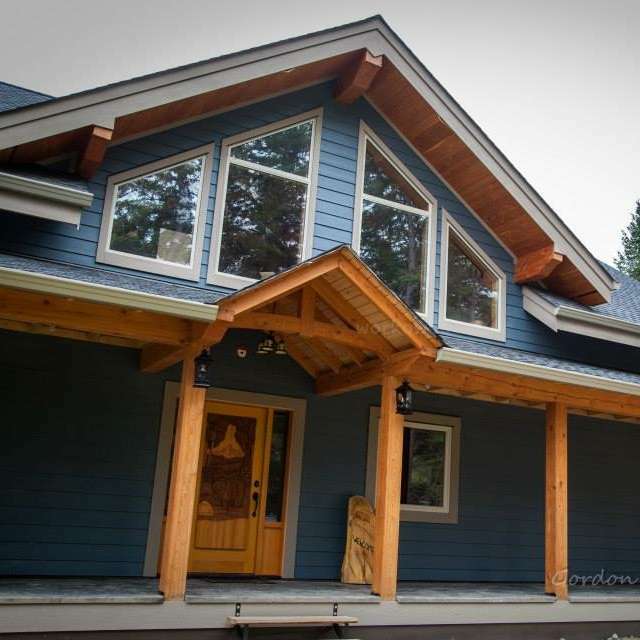 Four years ago we built our dream timber frame home however there are still lots of little projects in the house and yard that just never got done. We can always use extra help around the house with cleaning and we greatly appreciate when our workawayers cook for us as we love trying new meals from around the world. Weeding in the garden and help with basic lawn care is always on going as well. We have bunnies, chickens, a large dog, small dog and cats. Sometimes help caring for the animals is required. Willingness to take on small projects around the home and yard. - addimg onto the kids playground. Putting roofing on it. We are also looking for somebody who is good with children who is willing to get to know our kids and help them learn about other parts of the world by sharing your culture and experience with them. Be willing to have fun and play. We love adventure and hope you're able to create some fun and bring some new experiences to us as well. While you are staying at our home we will treat you like another member of our family and will expect help with cleaning up after meals and that you keep your area clean and tidy as well. We have a large, custom, three story timber frame house located in a remote area 10 minutes from a small town. Therefore it is an added bonus if you have your own transportation as there is no public transit here or if you just love being among nature away from the busy city life then our place is for you. We have a (nearly) finished basement with a bedroom furnished for your comfort. (2 to choose from!) as well as a bathroom for your use. There is a little sitting area as well as a games area downstairs as well. We try to make it as cozy and comfortable for our workaways as possible. We will provide you with your food however appreciate help with some meal planning and preparation. Most days you will have to prep your own breakfast and lunch however we always have big family dinners together. Guests must be ok with spending some time alone as my husband and I both work and the children attend school and daycare. We are near Wells Gray Provinical park which has many beautiful waterfalls and great hiking trails. We have many lakes close for your enjoyment. We live in the country side. 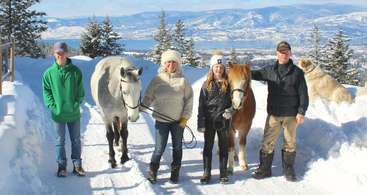 In the winter there is snowshoeing, cross country skiing, ice fishing, snowmobiling and sledding. We look forward to meeting New people, providing our kids with an opportunity to learn about cultures and different parts of the world. We expect that people staying in our home are kind, good with children, willing to help out and act as an additional member of our family while here. Must be able to self entertain and be comfortable spending some time alone as we are on the go a lot. Our place is ideal for couples who enjoy working and playing together! Our lambs on our front yard. The winter view from our great room. 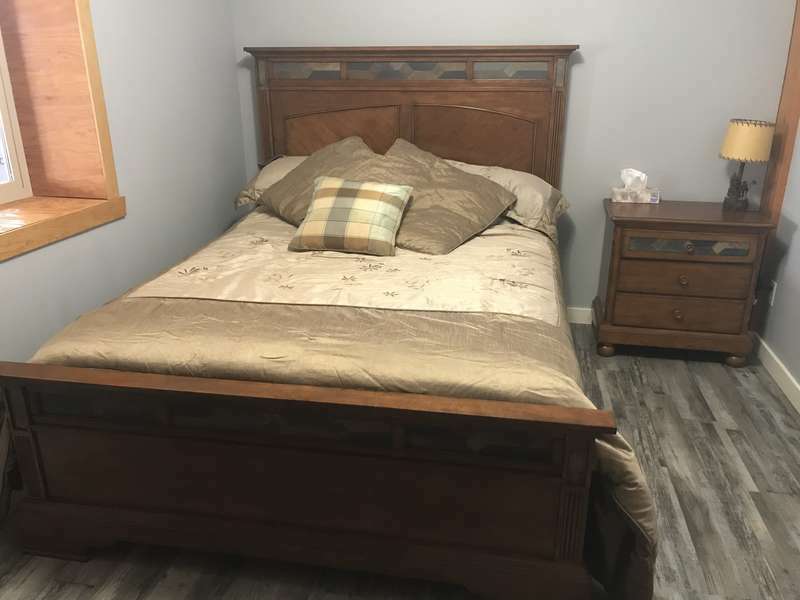 Bedroom in the basement with a queen bed and dresser. Moul falls at Wells grey park. Just over a hour from our house you can walk right behind this fall. This was my first ever Workaway experience and I couldn't have been luckier with these hosts! I would have given them 10 stars if I could! Long before my arrival Ashley and I chatted and exchanged pictures which made me feel comfortable going to their place for the beginning of my big solo trip. Ashley and Trevor are super easy going and were… read more patient with me while I was adjusting to the time change and settling into Canada. In less than a week, each family member stole a little piece of my heart! The kids are a true joy to be around. I had the best time hanging out and making memories with Tessa, and helping her with her school projects. And Weston is the cutest of them all, hugging me every hour of every day until he'd fall asleep. The older boys are really nice and easy-going too, I had fun learning all about basketball and playing new card games. While staying with the family, Ashley and Trevor went above and beyond to take me out on the best adventures, even though it was -25!!! 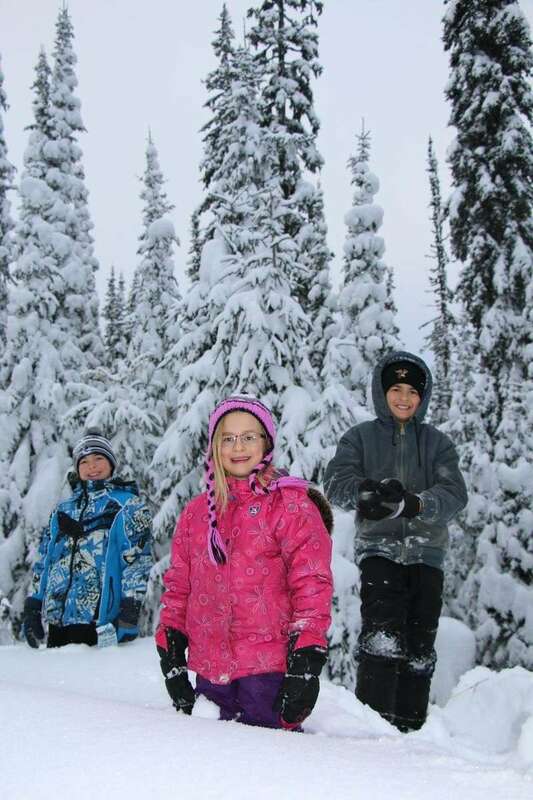 We went snowmobiling, ice fishing (3rd time lucky), visited the wonderful Wells Gray park and went cross country skiing. We even spotted a cougar on the farm! I was also allowed to join in on all the local activities in the small town the family lives in, such as high school basketball games and the kids' club activities. Ashley and I bonded over the numerous crafting projects that were going on while I was there and we are now a professional Cricut team! Even though it took me some time to get used to living in a remote area (the house is out of town and some days you will be by yourself), I was happy to get the house organised, take out the dog for a walk, cook and keep busy with any projects I found. After about a week, you will know most people in town and you will get to meet many family members during your stay, who are all incredibly nice! Ashley is an amazing cook. I loved all of her meals and am in desperate need of her cinnamon buns. The house is beautiful and the views are amazing. You get your pick out of 2 large bedrooms with comfortable beds and a closet, and you will have your own private bathroom. I was hardly ever in my room as I was always spending time with the family! I only stayed for 3 weeks but will definitely be back soon to spend more time with this truly amazing family. Trevor and Ashley are considerate, incredibly generous and did so much for me, for which I'll be forever grateful. They made me feel like a family member and friend. Thank you for all that you did for me! Merel spent only a few weeks with us however during that time she earned a very special place in our hearts. She is a kind, caring and compassionate soul who we truly felt lucky to have in our presence and influencing our children. Even though it took a couple days for her to recover from her jet lag Everyone fell in love with Merel in no time.… read more She was so thoughtful to bring our family a thank you gift- yummy cookies from her home country and a Disney card game to prepare us for our big trip. Merel fit into our family seamlessly and joined us on all our outings and family events. She clearly cared about the kids and was quick to form relationships with them and offer them help with homework etc. She helped me make countless Disney shirts for our big trip and I never could’ve got it done without her- plus it was so much more fun having somebody to craft with! Merel didn’t sit around waiting to be asked to do something instead she saw what needed to be done and did it. I thought I loved making lists and organizing however Merel definitely one upped me on this- she is the queen of organization/ lists. If anyone is lucky enough to have Merel request to come stay with their family or join their business I highly suggest you take her up on it- you will be happy you did. 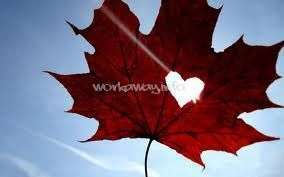 Merel we hope to always stay in touch and wish you nothing but amazing adventures on your journey around Canada. Please come back and visit while you’re here! Thank you for your help, friendship and for being you. This was my second workaway experience, so I didn't really know what to expect as I am pretty new to the whole workaway thing. It was honestly the best decision I ever made, the most amazing couple of weeks I have spent in Canada. The family were super welcoming and really made me feel like apart of the family. 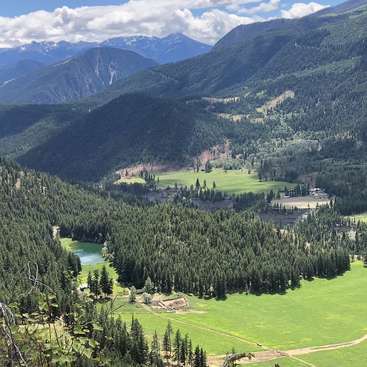 I really got to experience life on a… read more Canadian ranch and thats more than I could ever ask for. I had such a lovely time getting to know each and everyone of them, even little maple! I had the most fun with little Wes he never seeked to entertain me! (I hope he's coping without the fish game haha). Most of my time was spent outside working on a couple of different projects which I really enjoyed and was suited to my skills, such as making horse gate jumps to building chicken pens! I got the chance to experience many different adventure- hunting, quadding, ice skating, toasting hot-dogs over the fire, waterfall hikes and geocaching which was the coolest thing ever, I really enjoyed spending time with the family! They definitely exposed me to a lot of new things that I may never have got the chance to do so and I am grateful to have had the chance to experience all that I have with the best people! If you get the chance I definitely recommend a workaway with this family, you will have the most amazing experience, you will never be bored as there is always so much new things to see and do! If you love the outdoors this is place to be, this family will show you how it's done! The family did so much for me and I wish I could have given them so much more back, I am forever grateful for the experiences and friendships this family has given me. I already miss them, and will definitely be staying in touch! We stayed with the family 5 weeks. It was our third stay in Canada, but the first experience with a true Canadian family. As it is always little hard for us to come to someone’s home and join their everyday life, this family made it much easier. We can say now that we really felt as a part of the family with everything it offers. We met most of… read more the family members (grandparents, siblings, aunts, uncles …), joined a few family occasions, visited kids’ hobby lessons, went for trips together etc. As Trevor says, they are an easy going family, and they really are. The work is easy and you can choose the project which is most suitable for you. For example we stayed before Weston’s birthday and I like hand-crafting, so I spend a lot of time working on birthday decorations. Other work included weeding, usual household work, feeding animals, watering flowers, etc. We also had a lot of free time which we spent mostly with the family. They are very active and want you to have fun. We are very grateful for everything we could try and experience with them (fishing, four wheel riding, kayaking, water tubing …). I have to admit that we sometimes felt bad that they had given us more than we could have done for them. I can continue with praising of this family, but all the reviews are saying the same. If you have an opportunity to stay with them, you should do it and don’t think twice about it. You will have an amazing time there. Thank you again! We hope that we will see you in Chilliwack for the next trip together. Petra and Ondrej spent five weeks with us. In that time they stole our hearts. These two are incredibly kind and hard working people. They are a bit reserved and it took us a little bit longer to get to know them but once we did we learned just how valuable and genuine they are. They were always very quick to help. And not the kind of people who… read more sit around waiting to be asked to do something- they took initiative and would always find somewhere they could be helpful. They worked hard and made sure everything they did was done to the best of their ability. They really were incredible helpers to have around. Our toddler was going through a challenging time and they were very patient with him and continued working at forming a connection with him- even when he made it challenging. Our older kids really took to them and enjoyed their company and the time they spent getting to know them. Ondrej and Petra helped prepare meals, cut, chop and split firewood, painted out buildings, prepared birthday party decorations, finished landscaping the yard, worked in the garden, house sat our home for 10 days, did house cleaning and some finishing projects around the house. We couldn’t have asked for a better couple. The whole time we were away on holidays we rested easy knowing our home was well taken care of. In The beginning of June Ondrej and Petra arrived to our home as strangers and after many adventures, conversations and work bees we now consider them friends and are very grateful they’ve came into our lives. Hope to see you both again before you leave Canada. Sophia and Juan were so enjoyable to get to know. We loved learning about their farms in Chili and how farming is the same and different in their home country. We really hope to be able to visit your farms someday. Sophia was full of great conversation and acted as a great translator between us and Juan and even though Juan is limited with his… read more english we still always felt like we were able to communicate with him and we greatly enjoyed his smiles and jokes. We appreciated the help they gave us with building onto our sheep pen and all the other help around the house and yard. The children all loved them and Tess is still sad she was on holiday for most your time here. You guys are a wonderful couple and we are happy that you came into our lives! Wishing you the best. This was our first Workaway experience and we had such an amazing time with this awesome family. From the day we arrived the whole family made us feel so comfortable in their beautiful home. 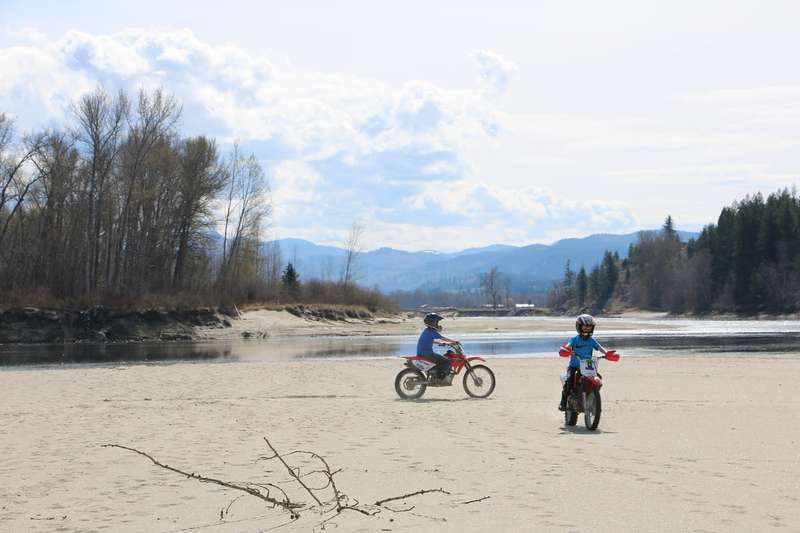 We got up to a lot in our short 2 weeks here, with Ashley taking us to various spots for hikes around the area and Trevor guiding us on multiple bear hunts… read more through the family farm on the four-wheelers. The children keep you busy but in the best kind of way. Cam showed us how 12 year olds can run their own farms, while Jer and Tess immersed us in their different hobbies. We had so much fun being around them and spent half our time laughing through conversations with Wes! With regard to work - we mostly spent time in the Garden and working on keeping the Rabbits apart (not sure how many babies there are now though?). We can't thanks you guys enough for your hospitality and we'll definitely try to come back and see you on our way back through Canada! I spend almost 3 weeks with the family. It was my first workaway experience and it couldn't have been better. They are very welcoming, friendly and open minded. I met also the kids' grandparents and other family members during on Easter and they were all very nice. 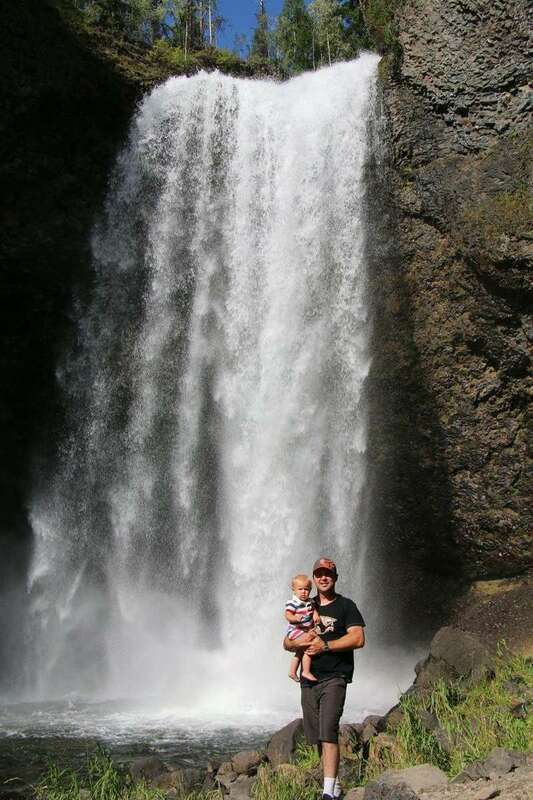 They showed me the area, I went snowboarding with the kids and saw some of the… read more waterfalls nearby. I felt as part of the family and the things I had to do where just helping a little bit with the household and cooking ( what I really enjoy). I am really thankful and enjoyed my time there, I can only recommend them as workaway hosts. The family are really special - we had an awesome two weeks with them this winter. 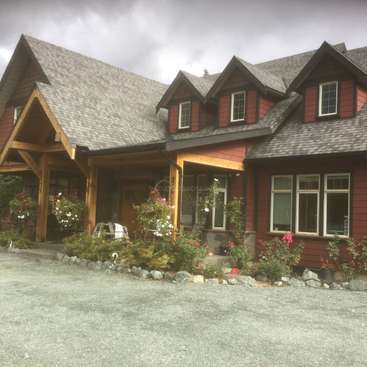 The North Thompson valley is such a picturesque area and the family home is a beautiful timber frame house with loads of spare room. We had our own bedroom and bathroom tucked away for some privacy, but enjoyed spending time with the family so much we hardly needed… read more it. The whole family were so welcoming from beginning to end - Ashley and Trevor are great hosts, the kids are an absolute pleasure to spend time with. The pets are adorable. Every day we did something fun and there are plenty of activities to get stuck into in the great outdoors. 100% positive experience and we’re so grateful to the whole family for their warmth and generosity during our stay. Looking forward to staying in touch with the family in the future. Ben and Aileen spent two weeks at our home. They were super thoughtful and kind. We enjoyed every minute spent with them. They arrived with thoughtful gifts for our children (books for the book nook they were creating while here) as well as treats for us. They were appreciative of everything we took them to do. They did everything we asked of them… read more and then some. They were intuitive and knew what needed to be done and would step in whenever they saw help could be offered. They were great with interacting and playing with our children. They also cared for our home and animals while we were away for four days and we never had to worry about a thing as we knew right away after meeting them that they were responsible and would take good care of things. Even though they were only here for two weeks they earned a special place in our memories and we hope our paths cross again. Franzi was such a sweet young girl who spent two weeks with our family before starting a job at our local ski hill for the season. She was easy to get along with and enjoyable to be around. She was happy to teach the kids about her country and even share a delicious German stick bread recipe with us which she kindly made us to roast over the fire.… read more She was willing to do any little tasks we asked of her and she was happy to visit with the children. Our youngest Weston (age 2) fell in love with her the first day she was here and still asks about her (months after she left). We hope you have a fantastic time here in Canada Franzi! It was a pleasure meeting you. I can definitely recommend to stay with this amazing family. I was able to share their life for two weeks in October 2017 and loved every minute of it. You will live in their amazing house surrounded by nature and have your one private bedroom and bathroom. Everyone was so welcoming and I felt as a part of their family from the first day. I'm… read more so grateful for all the trips we did together. They showed me their area and took me to all those hidden spots you probably would miss as a normal tourists. We went hiking, paddling and I could ride a four wheel at -15°. But i can promise you that in the summer season there will be even more fun outdoor activities!! I even got to join their birthday dinners and all their family events which was an amazing experience. During my stay I was also preparing for a ski season in Sun Peaks and they tried to help me with that in every possible way. The work is definitely not too hard. I helped with general tasks in the house and had some small projects which I did while Ashley was at work. 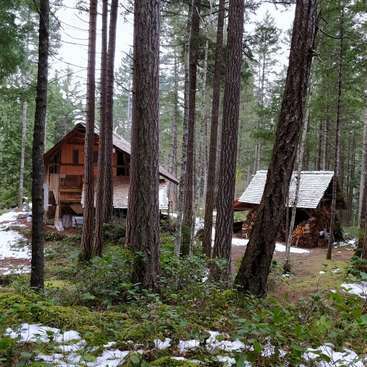 The rest of the time I could enjoy their beautiful house and go for hikes around the area. I had no own vehicle at the time I stayed with them but I would recommend you to have own if you are staying for a longer period of time. Ashley tries here best to take you to all the places you want to go but with four kids and a job there are of course many other things that need to be done as well. So if you are reading this: Stop thinking and just write them a message. Their is no better place to experience this area, the nature, lots of outdoor activities and the life of a Canadian family. Thank you again family for everything and I'm pretty sure that I'll see you again this winter!! Craig and Arianne spent around 11 weeks living in our home with us. They were very fun and had great senses of humour making them enjoyable to be around. During this time we all formed bonds with them, especially our children and we will miss them dearly. It was great help having them helping us out around the house and we appreciated how much… read more time they spent with the kids playing. We hope you enjoy the rest of your travels and hope our paths cross again some time in the future. We stayed with the family for 2 and 1/2 months and it was the best workaway experience we have had (we have done lots!) The house and location are amazing and the work is not hard and is always appreciated. We stayed in winter so we did mostly inside chores and projects and we had fun doing them! Most importantly though - Ashley, Trevor and the… read more Kids and the rest of the family that you’ll probably meet are the best company, they are friendly and fun and really make you feel like a part of the family. We loved going out for day trips with them and they are always willing to show you around or offer advice. Ashley always has fun activities planned and Trevor helped us find the moose we’d been hoping to see our whole trip :-D! The kids will entertain you for hours and they are great fun! The only negative we can say is that you’ll find it hard to leave and now we are going to miss them all lots!